The United States Food and Drug Administration (FDA) and other regulatory bodies around the world require that impurities in drug substance and drug product levels recommended by the International Conference on Harmonisation (ICH) be isolated and characterized. Identifying process-related impurities and degradation products also helps us to understand the production of impurities and assists in defining degradation mechanisms. When this process is performed at an early stage, there is ample time to address various aspects of drug development to prevent or control the production of impurities and degradation products well before the regulatory filing and thus assure production of a high-quality drug product. This book, therefore, has been designed to meet the need for a reference text on the complex process of isolation and characterization of process-related (synthesis and formulation) impurities and degradation products to meet critical requlatory requirements. It's objective is to provide guidance on isolating and characterizing impurities of pharmaceuticals such as drug candidates, drug substances, and drug products. 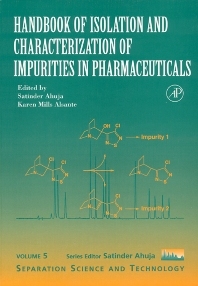 The book outlines impurity identification processes and will be a key resource document for impurity analysis, isolation/synthesis, and characterization. Provides valuable information on isolation and characterization of impurities. Gives a regulatory perspective on the subject. Describes various considerations involved in meeting regulatory requirements. Discusses various sources of impurities and degredation products. Dr. Karen Mills Alsante is a Senior Research Investigator in the Analytical Research & Development Department at Pfizer Groton Central Research. She worked as a Development Scientist in Groton Quality Operations for 3 years before moving to her current position in the Analytical Research & Development department in 1997. Over the past five years, Karen has established a Degredation Technology Group with the mission of gaining a better understanding of the chemical and physical stability of Pfizer drug substances and drug products at an earlier stage of the drug development process.